Rabash wrote the first article on the work in the group on a cigarette paper when he was sitting with me on a bench in the park. We then bought him a typewriter, and for the whole day the sounds of tapping on keys came from his room. This was his life. He kept thinking of the right way to express his thoughts. At the time of writing articles, he was a completely different person. We cannot even imagine the depth of his work. Even now I only get the uppermost layer of his writings. Question: Even an article that we studied 200 times…? Answer: It does not matter. In Kabbalah, there is no division of information for beginners and advanced Kabbalists, because the depth of the text depends only on the reader who comprehends it. In these articles he laid out almost everything. They are designed for those who want to rise from the animal level of development to the human (Adam) level. What Does The Creator Have To Do With It? Question from Facebook: Everything you teach is pure psychology of the relationships between people. What do the Creator, Light, and all other attributes have to do with it? Answer: The fact is that the Creator is attained between people when a special relationship of bestowal and love appears between them. Not earthly bestowal, earthly love, but on a higher level, that is, above our egoism. In order to rise to the next level, above our egoism, the wisdom of Kabbalah is needed, which, in principle, deals only with this. That is, it is psychology, but on the next, higher level. Materialistic psychology cannot deal with this; it does not have tools for this, no power of Light that can inversely change a person. Therefore, psychology is psychology, and Kabbalah is Kabbalah. Question: Is it possible to say that materialistic psychology adapts us to the earthly reality, and Kabbalistic psychology, to the upper reality? Answer: Of course, I adapt myself to a different system of relations built on complete disconnection from my egoism and above it. Question: What are the characteristics of the soul? Are a person’s character traits relevant to the soul? Answer: No. A soul is only the characteristic of bestowal and love, it has no relevance to the present concepts of bestowal and love in our world: Joseph loves Sarah, Sarah loves Joseph, or Andrew gives a gift to Nicole. This is not the same love and not the same gift. Question: How can it be that a higher soul, which is more significant and stronger, has no influence on the material level that is lower and weaker than it? Answer: It does have an influence, and how! But that higher soul influences such that these lower and weaker souls don’t feel it. Moreover, it participates in their development. Question: Does a planet exist in the universe where a person is born with a complete soul that did not become broken and is not inclined to corporeal changes through birth and death? Answer: Nowhere except for Earth will you encounter the kind of life that exists here that is attracted to the spiritual world. Our planet is unique this way. Question: What are the laws of the soul? Answer: The laws of the upper world: the characteristic of bestowal, dependence on a Masach (screen), Aviut (thickness – the depth of desire), and Reshimot (reminiscences – data of spiritual knowledge). This is everything that we learn in the wisdom of Kabbalah; these are the laws of the development of the soul. Question: Could there be a situation that in the present incarnation some souls have already ascended higher and others have no hope and are destined to be reborn? Answer: Yes. In principle this is so. Question: How does religion influence the development of the soul? Answer: Religion does not influence and has no relevance to the development of the soul, so you should become involved with and learn the wisdom of Kabbalah. Question: Is it possible to say that through acquiring a soul and attracting higher forces, I will be able to ascend to higher worlds while I am still alive, will continue ascending there and elevating humanity? Is this the meaning of the wisdom of Kabbalah? Answer: Yes. Very well phrased. Question: Do you have the ability to remain in our world for the sake of your present and future students until the full return of the reconnected soul of Adam? Answer: All of us are mutually connected in every state. When necessary, I will disappear, and when necessary, I will return. Question: If a person makes the wrong choice that is not appropriate for the development of his soul, will the higher powers direct him toward the right choice? Answer: No, the higher powers only make it possible for a person to choose whether to advance or not, helped by freedom of choice. Question: Can a criminal or a thief be a spiritual person? Answer: No. A spiritual person cannot steal. He can carry out some kind of activity that in our eyes is perceived as bad, but in fact he is serving a higher purpose. 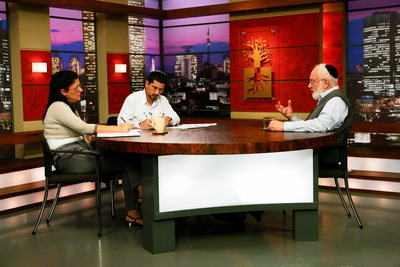 Question: Why were we specifically chosen to be involved with the wisdom of Kabbalah? Question: Are there unique, chosen souls, and do they feel their uniqueness? Answer: Every person feels unique because his soul is individual. But uniqueness is examined solely and only through realization; therefore, it is necessary to prepare seriously for spiritual realization, to participate in it and to instigate it. The correct use of our egoistic nature is to ensure that the benefit of the individual and the society are connected. Today, people love their children and grandchildren but the ego doesn’t allow us to build a better world for them. The world is developing according to egoism based on private gain at any price and it is destructive. Less efficient and useless products are made for the sake of bigger profits. This type of egoism is collapsing and being replaced with human connection and partnership. Harmony between the parts brings general health to the entire system as can be seen in nature and in the living body.